– In the first round of Turkish league Istanbul Basaksehir beat Fenerbahce. Have you analysed that game? Will your opponents be different compared to the Istanbul match? – Good day to you. We do understand that they are a very good team. I have already said that before the first leg. And the result of the game with Fenerbahce shows that I was right. Tomorrow we expect a difficult match. It is clear that the opponents being at a disadvantage, will come with one goal - to win. The result is the only thing that interests them. So tomorrow, we expect to see a team that will show themselves completely differently compared to our match in Turkey. We expect quality opponents that will pose difficulty for us. – You say that you expect a different game from Istanbul Basaksehir. 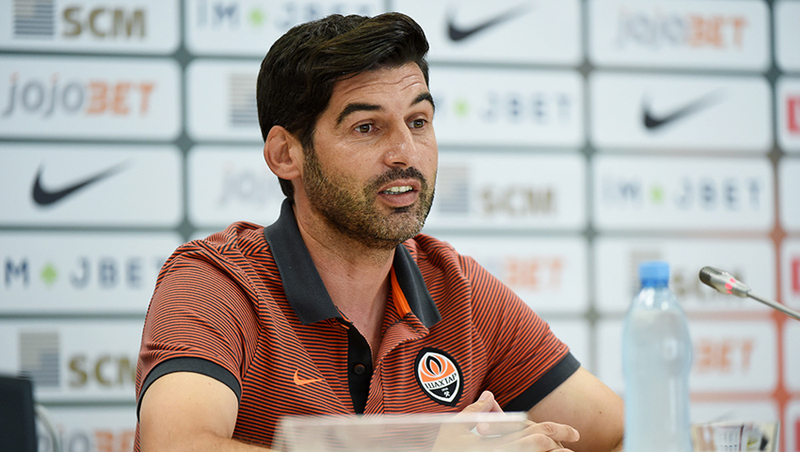 Will Shakhtar be different? Or will you not deviate from your tactics and plans, regardless of the opponents? – Shakhtar never change their ideas. As I said, regardless of the opponents and the field where we hold a match, we always try to dominate the game. What does it mean? Possession of the ball and playing on the opponents' side of the field, attacking. We will try to show this kind of football all the time. It is obvious that it can sometimes depend on the opponents. In football, it so happens that some team, including us, may not cope with something. But I truly believe that tomorrow we will show attacking football. – Analysing the return match against Young Boys, many have noted that the laxness of the team and perhaps underestimation of the opponents. You have just beat Dnipro easily. Will this relax the Pitmen? – It should not happen. We all understand the importance of the next match. The return match against Young Boys served as an excellent example of how things should not happen. I think the whole team has learned a valuable lesson from that game. – As we know, every second ticket for tomorrow's match is free. Full arena is not expected, but perhaps, in honour of the Independence Day of Ukraine you would like to personally invite Lviv residents to the game? – I'd really like to see full stadium supporting Shakhtar. Regardless of the number of fans in the stands, we feel their support. It is very important for us. Of course, we expect a lot of people tomorrow. I would like to invite absolutely everyone to the match. I hope for great football. I think the game will be interesting to see after today's celebration which should continue tomorrow. This is what we want to happen. I also want to congratulate all Ukrainians on the Independence Day, on the 25th anniversary. – You have already played a few matches in Lviv, both in European tournaments, and local. Do you like the way people support Shakhtar here? – I really like the Lviv fans. I did not like them only when I came here last season with Braga. I have noted many times how good the local support is here. I hope that tomorrow we will feel this once again. – Are there any injuries before the game and what do you expect tomorrow? – We look forward to a difficult game - there are no easy games now. The opponents will be very motivated after an excellent win in their league. To win, all the players must be ready 100 percent. As for those who will not participate, we have the same injured as before: Bernard, Shevchuk, Kanibolotskyi and Azevedo.